So far, I just eat it off of the spoon. When I am engaged in this act, I am too zombie-like to consider more creative uses. Specifically, those gingery molasses windmill cookies from back in the day. Worth the drive to Bellingham, to grab a jar. Or a case. Thanks to Detta for turning me on to the food mecca that is Trader Joe’s! « These are a few of my favourite things!!! Oh Trader Joe’s is BAD BAD but OH SOOOOO good!!!! 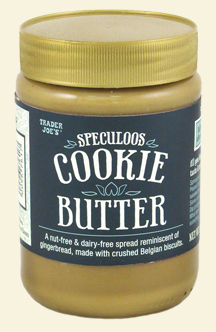 I will have to try cookie butter next time I’m over for a cup of tea – if you leave any in the jar! Growing up dutch, we thought Speculoos cookies (the ones in the shape of windmills etc) covered with a generous layer of butter and sugar, along with a strong cup of tea, was the best way to start our day.